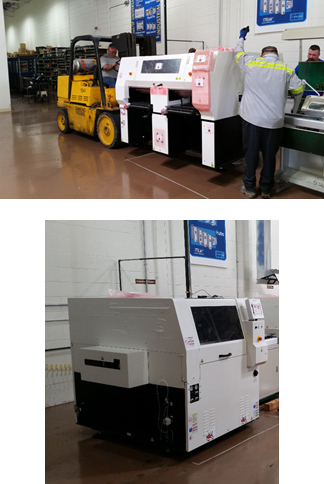 June 2016 - Contemporary Controls purchased two new surface-mount technology-manufacturing machines, a Panasonic AM100 placement machine and Panasonic SPP screen-printing machine. With the acquisition of the new Panasonic AM100, Contemporary Controls' Made in the USA manufacturing capabilities drastically increase. The AM100 is a modular, single-beam placement machine capable of placing component arrays at more than 35,800 cph with 160 reel inputs. The AM100 has a variety of useful advanced features including a 3D camera, side-view camera, board warp detection and auto-support pin set up. In addition to the AM100, Contemporary Controls also purchased a Panasonic SPG screen printing machine. The SPG is able to maintain a 15-second cycle time-cleaning and print every time and contains what Panasonic calls a hybrid squeegee head, which Panasonic states reduces cycle time. When asked how the new machines differ from ones they are replacing and what the differences mean for our customers, Renee Lucente, Manufacturing Supervisor/Production Specialist, stated "The new machines offer a greater component diversification along with an increased precision and efficiency, enabling us to expand our product design capabilities and reduce lead times. The purchase of these machines reflect our dedication as manufacturers in the electronics industry, enabling us to continue to grow with the complexity of technology."